Thankfully, we stay pretty healthy around here and I hope you do too. But just in case you need something to keep you on the up and up, be sure to have Homemade Vapor Rub on hand! It supports your body’s respiratory system and helps minimize the effects of seasonal threats. One way I try to protect our family is trying natural solutions first – not going to the doctor for every little thing. This happened to us just a few weeks ago. I had a bladder infection that would not clear up despite my attempts of using naturals solutions – see How to Cure Bladder Infections Naturally. My natural solutions usually work. And, they did but, after a few days, the bladder infection would come back. Not wanting to allow the bladder infection to develop into a kidney infection, I went to the doctor. Sure enough, the doctor’s waiting room was filled with people coughing, sneezing and just plain sick. Not surprisingly, I ended up with a cold which went into a flu-like virus. Yuck! It seems like it takes forever for something like that to go through everyone in our family. One person gets it, recovers and the next person comes down with it. By the time it cycles through all eight of us, a month has gone by! I love the benefits of using essential oils to support the body systems by giving the body what it needs for support, nurturing and maintenance. So, I left the doctor’s office and looked up what to use to help build our immune system and for respiratory support. A friend had gave me a book about essential oils, The Essential Life, and in it she had written a recipe for Homemade Vapor Rub that I make when seasonal threats are high. It was amazing how it supported our respiratory system and maintained clear airways and breathing. It is exciting to see our bodies react when supported and when given the proper tools. You might wonder, “why not just use prepackaged vapor from the store?” I used to, but then I found that it had petroleum in it, as well as, other unnecessary ingredients. Remember, the skin is the largest organ of the body and what you put on the skin is absorbed faster than the food you eat! So, it is important to know what you are using. In the recipe that follows, there are actually two recipes – one for infants and children under 6 years old and the other for children and adults over the age of six. Because essential oils are so potent they are a great tool when used correctly. Be sure to dilute your oils if you have sensitive skin or are using the oils on children. A good rule of thumb is when applying oils to infants, dilute 1-3 drops of essential oil to 1 tablespoon of fractionated coconut oil. When applying oils to children ages 2-5, dilute 1-3 drops of essential oil to 1 teaspoon fractionated coconut oil. 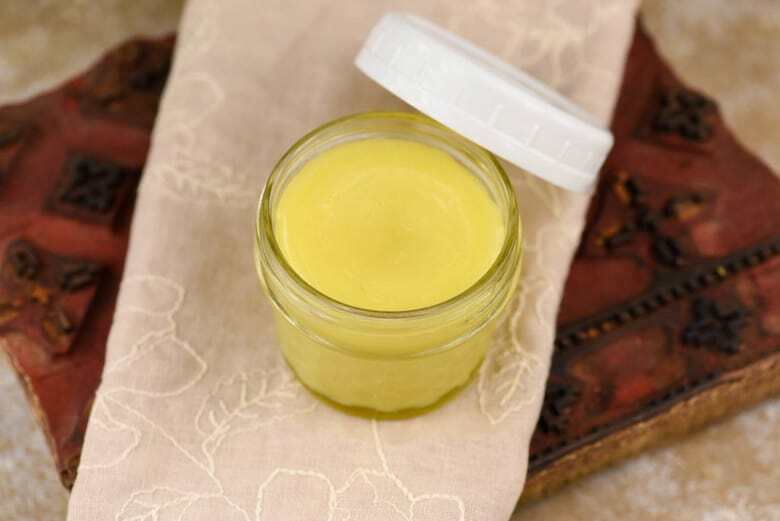 You can see how yellow my Homemade Vapor Rub is – I used beeswax from our honey bees! I think I have become a real homesteader – Ma from Little House would be proud! Melt the beeswax in the olive oil (or whichever oil you are using) in the microwave in 20-second intervals stirring between each interval until the beeswax is melted. Allow to cool slightly – if you wait too long it will begin to solidify but don’t worry, just microwave it again. Add the essential oils and stir well. Pour into desired glass container and allow to cool. What company do you recommend for ordering essential oils?